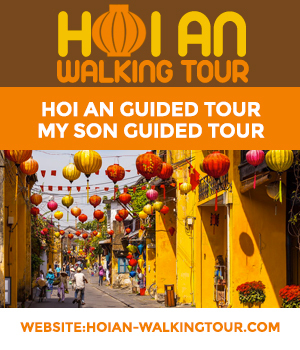 There are several ways to reach Hoi An from Da Nang, including the local bus. It’s the cheapest way, but not necessarily the most relaxing. We don’t really recommend it if you are travelling with young children. Why? Because you could be left standing if there are not enough seats and it’s noisy. The normal price is 16,000 VND, but in general you will pay 20,000. There is a surcharge for bulky baggage. You should pay 25,000 VND at the most. Tickets are sold on the bus, so there’s no need to buy them before. The buses run between 5:30 am and 5:30 pm (last bus). The buses leave Hoi An or Da Nang every 20 minutes. There are about 35 km between Da Nang and Hoi An, and the journey takes around 45 minutes. You can get off at Ngu Hanh Son to visit the Marble Mountains. Kon Tum: 280,000 VND (regular), 340,000 VND (2nd class). Ho Chi Minh City: 727,000 VND (regular), 992,000 VND (2nd class), sleeper 1,132,000 VND.